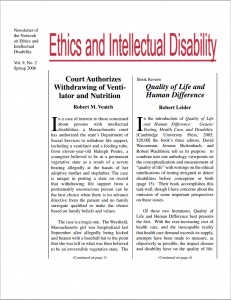 As part of the ongoing effort of the Bioethics Research Library to preserve and make accessible the history of the field of bioethics, we have digitized the entire run of Ethics and Intellectual Disability newsletters issued by the Kennedy Institute of Ethics and are proud to make them available to students and scholars. These newly digitized newsletters offer researchers the ability to explore ethical issues surrounding intellectual disability from a many different perspectives. In total eleven volumes were published consisting of two issues each. The last issue was published in the summer of 2008. Each newsletter contains articles, book reviews, literature bibliographies, case studies, important legal cases, as well as announcements of upcoming meetings and conferences. Each digitized issue is text-searchable allowing patrons to locate information quickly. The digital collection is permanently housed at Digital Georgetown, while the physical collection is maintained and preserved by the Archives of the Bioethics Research Library. The original announcement for the establishment of the Network on Ethics and Intellectual Disabilities provides additional context on this collection. View the full Ethics and Intellectual Disabilities Newsletter Collection at DigitalGeorgetown.